Want immediate updates and free music? 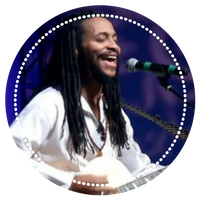 Subscribe to my Newsletter and get 3 free albums of my past music. 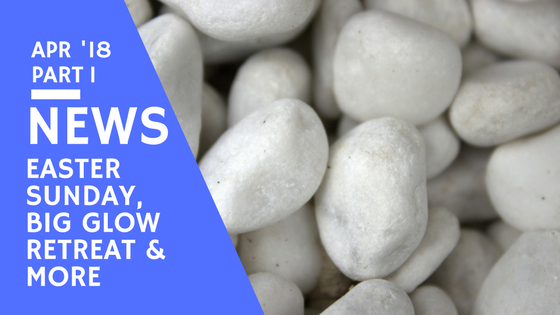 April Upcoming Events, Including Easter at TCSL, Big Glow & More! 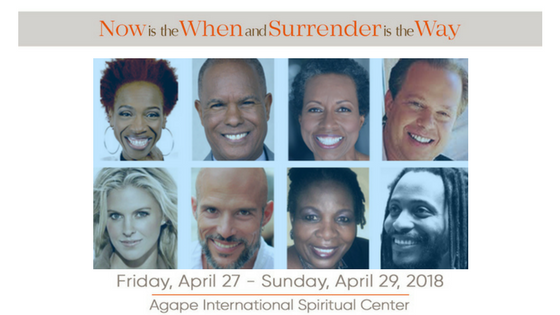 This April has several wonderful events we’d like to invite you to, including celebrating Easter with us at Trinity Center for Spiritual Living in Atlanta! I’m delighted to serve as the musical co-guest with the amazing Gwen Hughes, at Trinity Center for Spiritual Living this Easter Sunday. The inspiring Rev. Tony Crapollicchio will share the message and you can expect it to be one aligned with the resurection and renewal of the Christ. 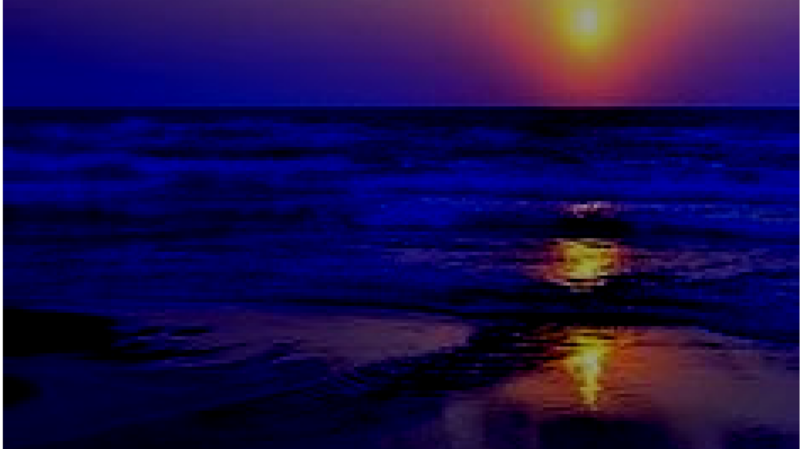 As I’ve come to experience, Christ is more than an individual: it is life / light / Word (logos) / divine reason or consciousness (“and the Word became flesh” – John 1:14, “In him was life, and the life was the light of all mankind” – John 1:4). This is part of what I will be there to celebreate going beyond belief so that we know / experience it! The Easter season affirms the promise of renewal, expansive spiritual growth and the innate ability to transcend old energy. Your consciousness maintains the promise of the Easter Season through a profound awareness that you are the avenue through which all of life expresses in glorious newness. This is The Victory of Easter. Join us for a day of affirming our birthright as extensions of / children of the Most High, the I AM, this Easter Sunday! 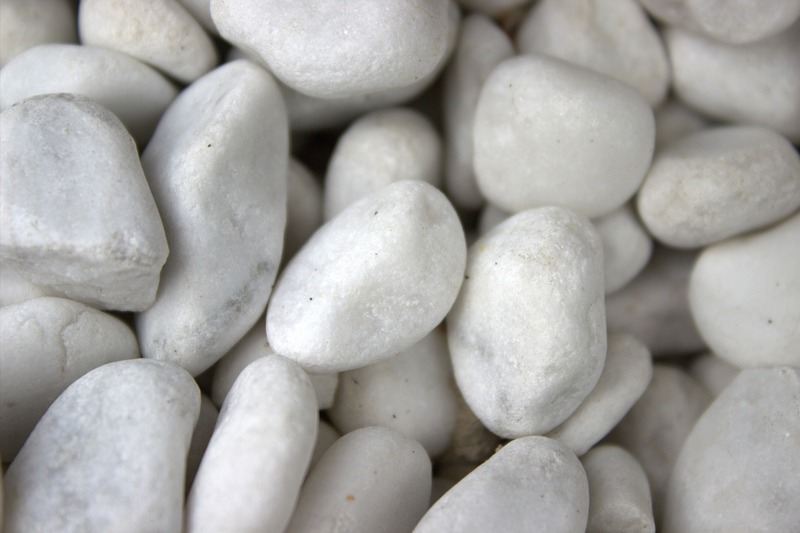 If you come to TCSL early enough, you can also participate in The White Stone Ceremony. 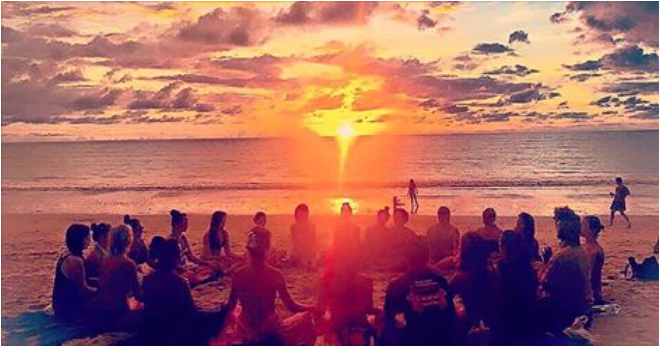 This ceremony is a blending of guided meditation, sacred sound and affirmation and it begins promptly at 10:00 A.M.
TCSL invites you to an Easter Brunch. The brunch begins immediately following service. The Walking the Labyrinth of Peace begins at 12:45 P.M. (more on that below). To ensure all who want to experience the sacredness of the labyrinth have the opportunity to do so, TCSL is providing a traditional Easter Brunch. There is nothing you need to bring or do other than enjoy our beloved community. Later that afternoon, beginning at 12:45pm on Easter Sunday, the Trinity Center for Spiritual Living is honored to offer the labyrinth meditation experience for the Easter Season. TCSL has procured a 15 foot Circle of Peace Labyrinth. The Circle of Peace™ is created using elements of Sacred Geometry and ratios represented in the beautiful 800 year old pavement labyrinth located in the cathedral in Chartres, France, circa 1201. You’ll also have a chance to walk it on Good Friday (see below). 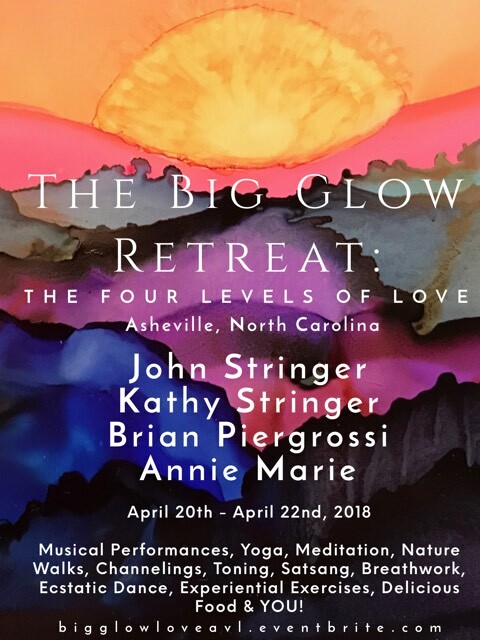 I’m thrilled to join my good friends, Brian Piergrossi, Annie Marrie, and Kathy Stringer for our Big Glow Retreat: The Four Levels of Love, in the beautiful surroundings of Asheville, NC. 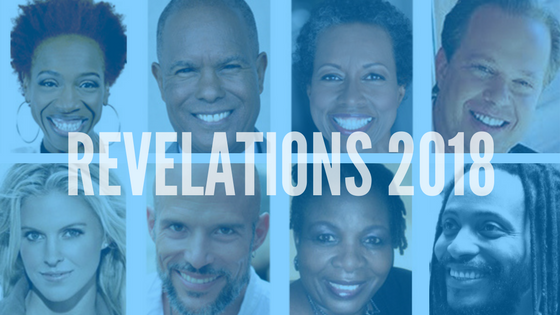 If you haven’t regiested you, go ahead and register here while the discounted pricing is still available, as space is nearly booked up! 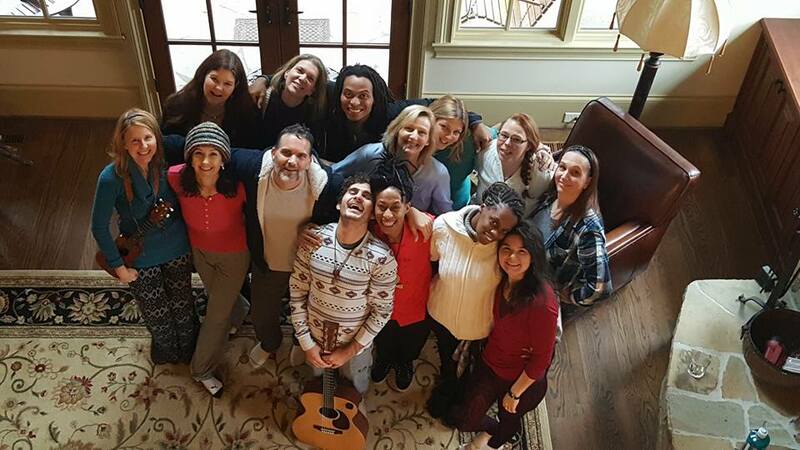 You’re invited to spend time with Brian Piergrossi, Annie Marie, Kathy Stringer and I during our upcoming Big Glow Retreat: The Four Levels of Love, Fri, Apr 20, 2:00 PM – Sun, Apr 22, 2018, 4:00 PM! 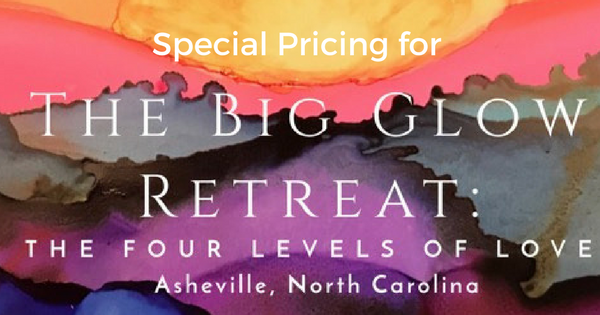 We’ll be in the amazing beauty and vibrant region of Asheville North Carolina, to transcend limiting beliefs and truly engage in the deepest levels of intimacy that inspire your relatings and brings you deep fulfillment and clarity within. Register now while the Middle Bird special is still going, up until April 12th, here (or use the special pricing for couples). What a trip!!! 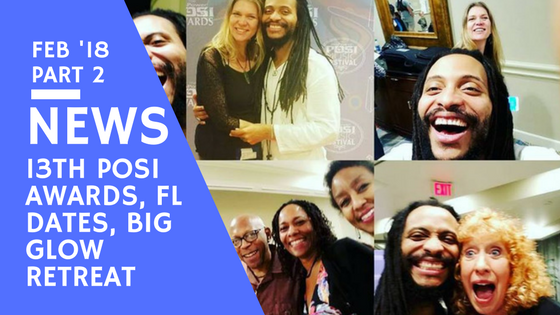 Kathy, our son, John, and I just wrapped up a wonderful experience in Tampa, FL at the 13th Annual Posi Music Awards where we got to cheer on and support all of the wonderful Posi Award nominees… and I can only say it was truly a blessed experience! It’s challenging to descibe how rewarding seeing so many like-hearted/minded folk in music is, all in one-place to celebrate love – so I’ve included images and videos to help! Add that many of our dear friends walked away with awards, and you can imagine why this event was such a truly #epic experience for us! If you haven’t been to the Posi Awards yet and you love positive/conscious music, then I highly recommend you check it out here. What Richard Mekdeci, Sue Riley and Russ Hammock have created with this event is simply amazing and has blessed so many in so many ways!!!!! Thank you!!!! 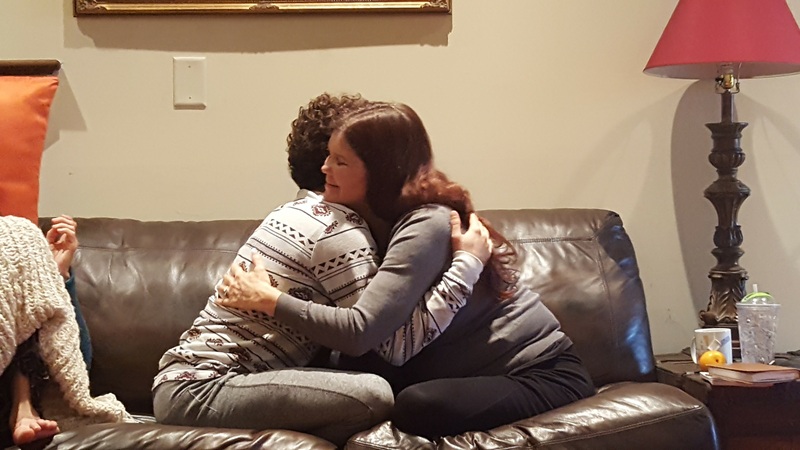 Since Kathy and I are also building a new butique management agency for positive speakers/musicians/authors, which includes our friend/client and amazing speaker/musician/songwriter, Jill Colucci, we were delighted that she also took home the Posi Award for the healing category!!!!!!! Congratulations to Bob, Jill, Patricia Bahia and all of our wonderful friends who won this year… as well as all those who were nominated! No matter what, WE ARE ALL WINNERS… and it was an honor to celebrate our many talents!!! 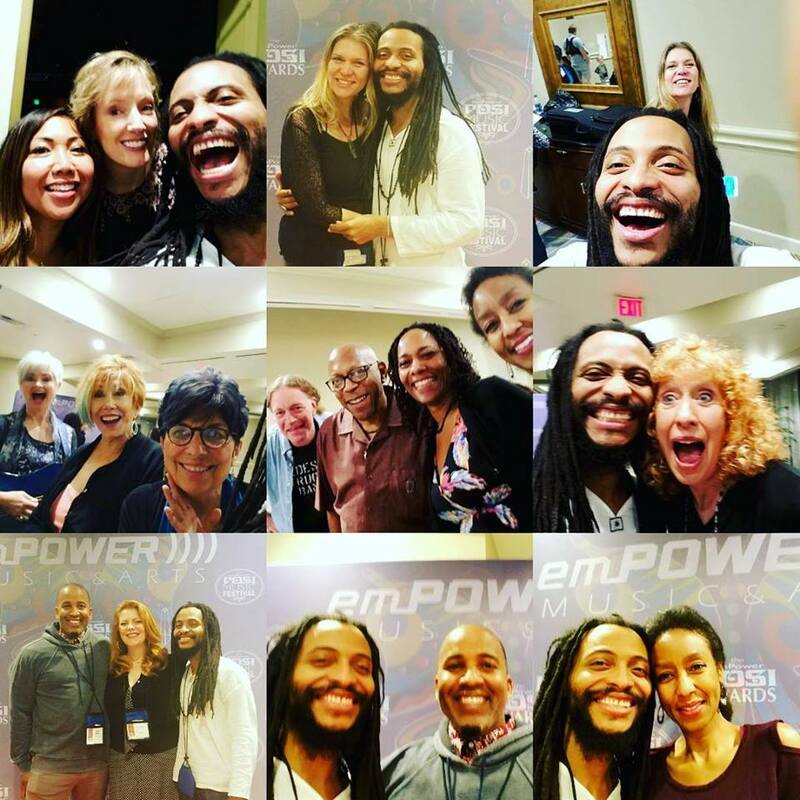 Here are a few more of the fun moments we enjoyed during the 13th Aunnual Posi Music Awards! Finally, another great treat during the Posi Music Fest was joining Jennifer Ferren & Diane Durrette to share music at the Suncoast Center for Spiritual Living on Sunday, 2/25/18… that’s three guest Posi artists during the same Sunday morning service! What a blessing! HUGE thanks to Jennifer and Rev. Laine Morgan for making this happen!!!! I look forward to returning to this wonderful Tampa, FL community later this year! 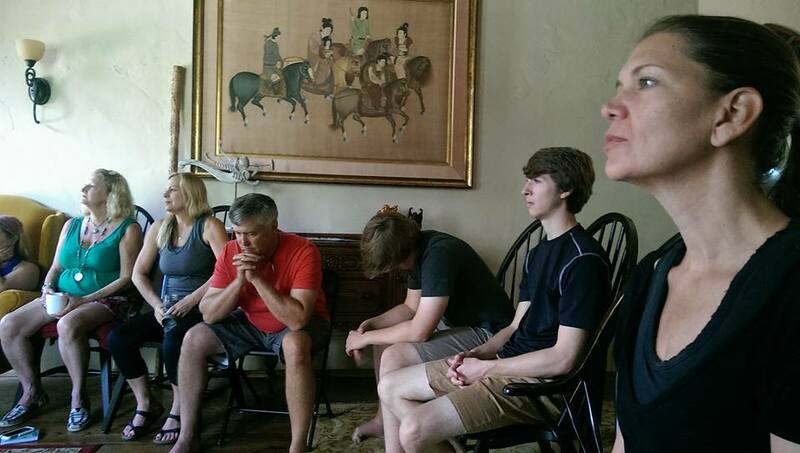 followed by a “Channeling Your Genius” Workshop in the afternoon! 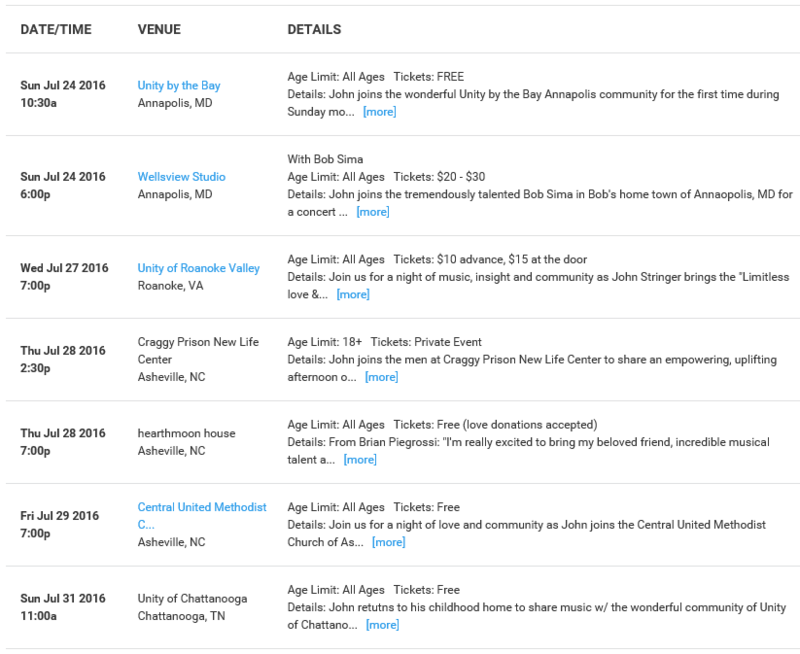 See full details for these and other events on the Tour page. If you haven’t already registered for our next Big Glow Retreat: The Four Levels of Love, I highly advise doing so before we sell out!!! To learn more and get registered, go here (or on Facebook here)! If you’d like to check out the talk I gave at Unity of the Triangle, entitled “Oneness through Diversity,” you can stream it from Unity of the Triangle‘s website here, and/or view the text & video here on my site. 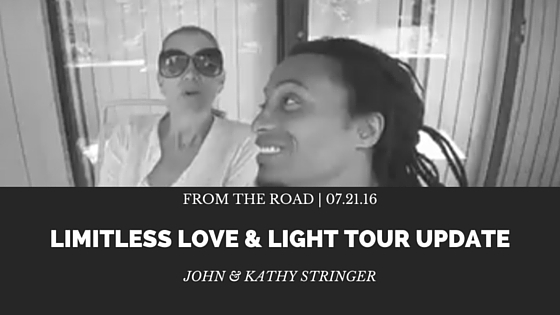 If you’ll be in Annapolis, MD on July 24, 2016, get your tickets to see Bob Sima and I at Concert In Consciousness here. In Asheville, NC, I’ll play a donation based House Concert & Meditation event with my dear friend, Brian Piergrossi on July 28th and a free concert at Central United Methodist! Love donations accepted at both events. 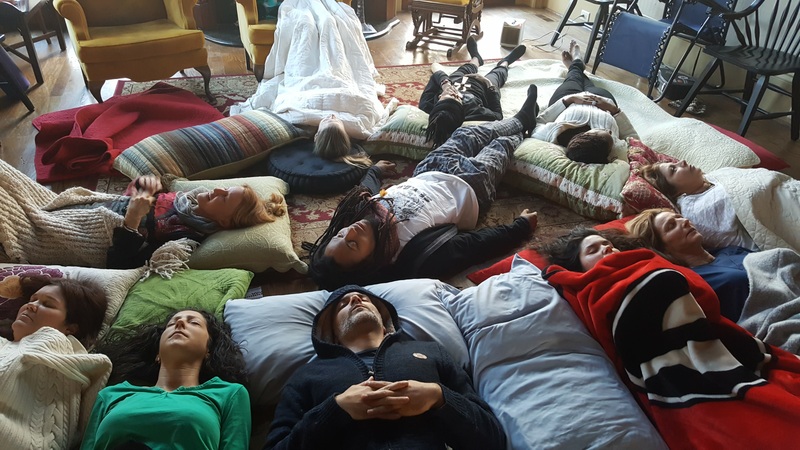 Only 4 spots left in the mansion for our all-inclusive 3-day Big Glow: Limitless Love & Light retreat. You can also choose camping for all 3 days or a one-day pass here. See the corresponding Facebook Event for all the latest updates. Finally, be sure to download my last 3 albums with my former band, State of Man, here free by joining the online community/newsletter, and pick up your copy of my solo debut, “Limitless Love & Light,” here. Looking forward to connecting with you in person soon!